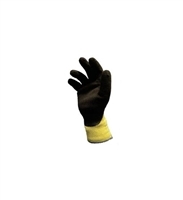 The Dutch Harbor Thermal Insulated Gripper Glove uses a durable latex coating over the fingers and palm for a sure grip. Heavyweight poly cotton insulation to keep your hand warm. An excellent item to keep in the tool, tackle or glove box.